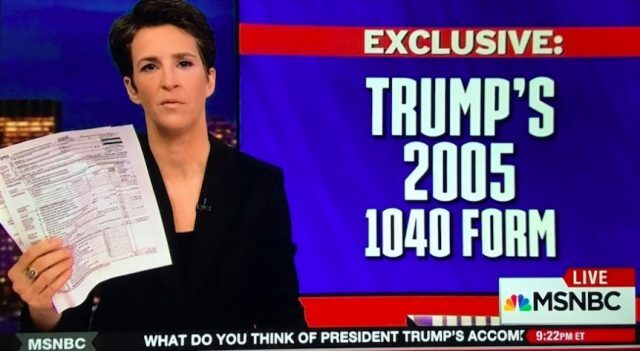 More than four million people watched Rachel Maddow unveil Donald Trump’s tax figures from 2005. According to the Hollywood Reporter, the audience for the MSNBC was 60 percent larger than it usually is when Maddow revealed two pages from a decade-old federal tax return at 9 p.m. on Tuesday night. She had a 1.2 rating in the key news demo of adults 25-54. Maddow teased her audience nearly 90 minutes before the show began that she “seriously” had the president’s tax returns. David Cay Johnston, the editor and founder of dcreport.org, said he received Trump’s tax information in the mail Monday. The return revealed that Trump paid $38 million in federal income taxes on a reported income of $150 million in 2005.